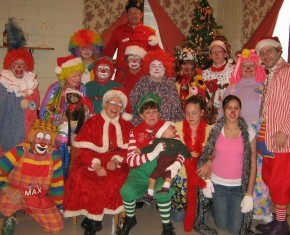 West Suburban Clown Club - Serving the Chicago Illinois area. Serving the Chicago Illinois area. Click on the photo above to zoom. Photo taken December 2006. West Suburban Clown Club is an organization serving professional and amateur clowns and related entertainers in the Chicago Illinois area. 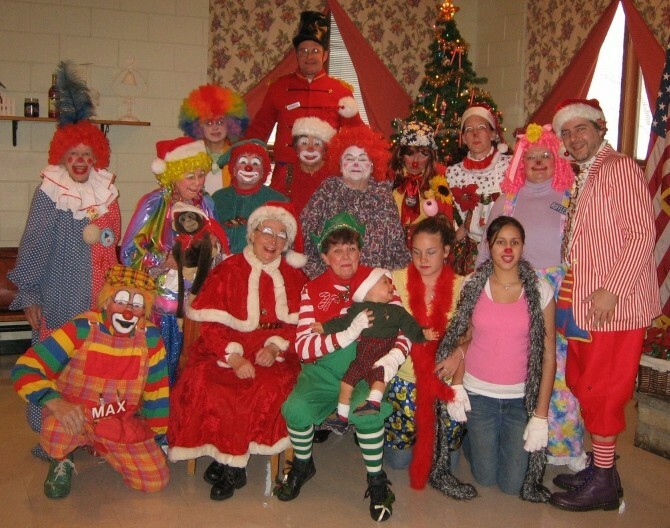 West Suburban Clown Club meets 7-9pm on the second Monday of every month in the basement level of the Meadowbrook Nursing Home, 339 9th Avenue, LaGrange IL. Participants should come to the rear of the building, labeled "ambulance entrance" around back, then ring the intercom buzzer next to the door to announce yourself for entrance; use the doors to the right of the intercom to enter building. From there proceed down one level (to the basement) then turn to your right and follow the hallway until you encounter the group. Each meeting has an intermission and may run late but starts on time. Restrooms and refreshments are available. Meetings generally include a presentation on some entertainment related topic such as balloon twisting, face painting, magic, history, business aspects, etc. Each year, members can participate in a number of public service clowning functions such as parades. Members receive a monthly newsletter by email or post. There is an annual holiday party banquet as well as select club outings. The club has a good library of clowning related books and videos, and also holds occasional swap meets. Potential members must perform in a certain number of club functions to be considered, then must be sponsored by an existing club member. Members pay small annual dues. Directions: YahooMaps  MapQuest  GoogleMaps  RTA. This website provided courtesy of Susan Hooper - "Not Your Ordinary Clown"
Website created by Andrew Bedno.